I’m so excited about this makeover because it’s going to break the rules a bit in terms of how this room is supposed to be used. 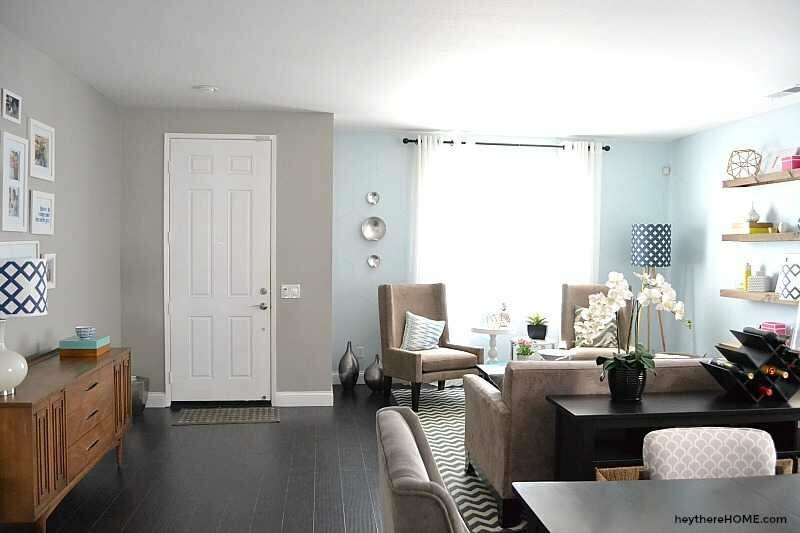 This is our front room and the first room you see when you walk into our very open floor plan home. It is supposed to be the entry, formal living room, and dining room all in one big open space. When we moved in we played by the rules and half of this space became the living room and half became the dining room. It wasn’t too long ago that I completed our dining room, but the truth is… we never even use it cause it just doesn’t work for us and our big crazy family. This entire space has become a big waste of square footage but that’s about to change because I’ve decided to join in on the One Room Challenge over at Calling It Home. Instead of this being half living room and half dining room, we are going to create a casual sitting area at the front of the house which will leave room for phase 2 of our front room makeover, a much bigger dining room. Yep! This mish-mash of stuff is mostly leaving and the footprint of the living room will shrink in size over the next 6 weeks. The plan is to transform it into a much more casual and bright sitting area — see my inspiration below. That means the only thing you see in this space now that’staying are the wingback chairs and maybe the lamps and some accessories. That’ll make room for some beautiful built-ins that will give this very cookie cutter tract home some much needed character. Because of budget, we’ve got to work in 2 phases. The first being the sitting area over the next 6 weeks, and in a few months we’ll be able to tackle the dining room. As you can see I’ve taken the large space and broken it into thirds instead of in half. The sitting area will only take up the front third and include a built-in with a window seat and 2 chairs. My decor plan is all about lots of blues and beach tones as well as a really casual vibe. 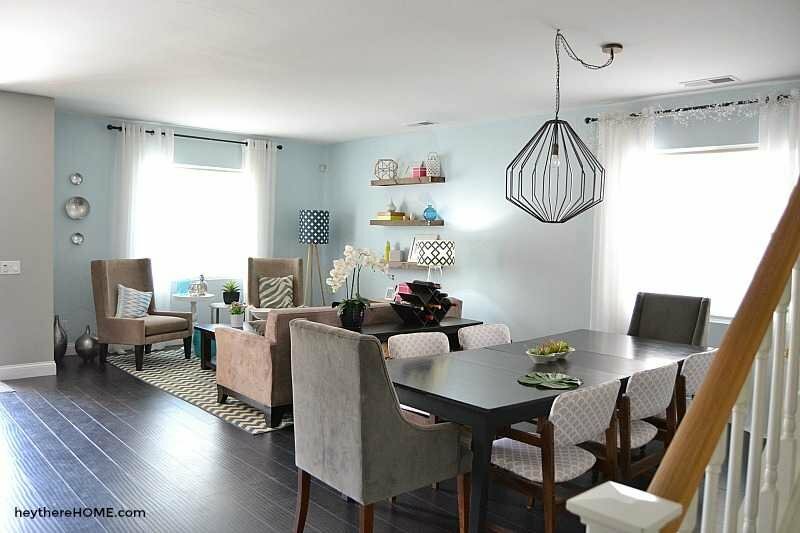 Below you can see inspiration for my built-in as well as lots of fabrics and textures that will definitely make this area casual and freshen it up instead of it being where we house all the furniture we don’t know what to do with. I’ve got my work cut out for me over the next 6 weeks and I can’t wait to share the progress with you each week! Ok. Well clearly, I better get clearing out the room and painting the walls! I really like your idea. Please keep us posted. I love your ideas! Looks like some terrific changes. Honestly your living room now does not look very “Lived” in. I think the changes your making will make the area very functional. Thanks so much, Lana! Glad to have you along for the journey! I’m excited to see the new transformation! Are you building the shelves/window seat from scratch, or hacking shelves? I have a similar project in mind for my upstairs “library room”, and am debating which direction to go. Hey Holly! The built-ins are going to be part big box store cabinets and made from scratch shelving. We’re also making the bench / window seat from scratch as well. Stay tuned for weekly updates on the progress! Stay tuned, Dorothy, and you’re sure to get some inspiration here! It would be hard for me to change something that looks this nice, but if it works for your family, that’s what’s important.